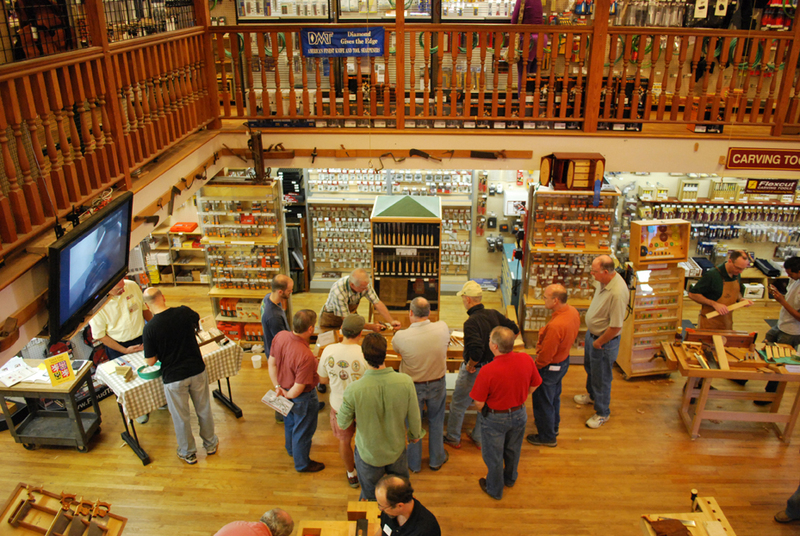 This weekend I had the pleasure of attending the Highland Woodworking Open House and Hand Tool Extravaganza. The event was an enormous amount of fun. 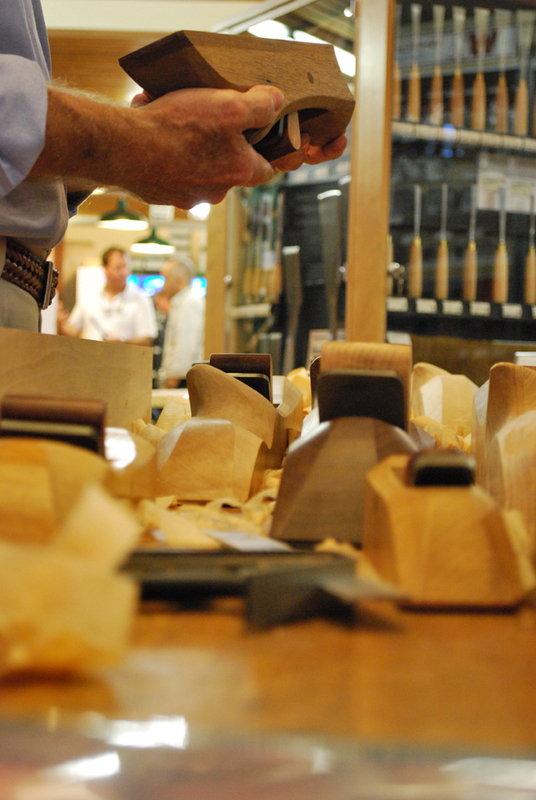 A whole bunch of woodworking knowledge was passed around, stories were told, and a bunch of wood shavings were made. There were some great woodworkers in attendance, including Scott Meek, Chris Kuehn, Frank Klausz, Curtis Turner, and more. I was able to swing by the store on Friday and got to meet some of the folks that were in attendance while the store was not quite as full; in the late hours of Friday evening after work I was able to meet Frank Klausz for the first time. 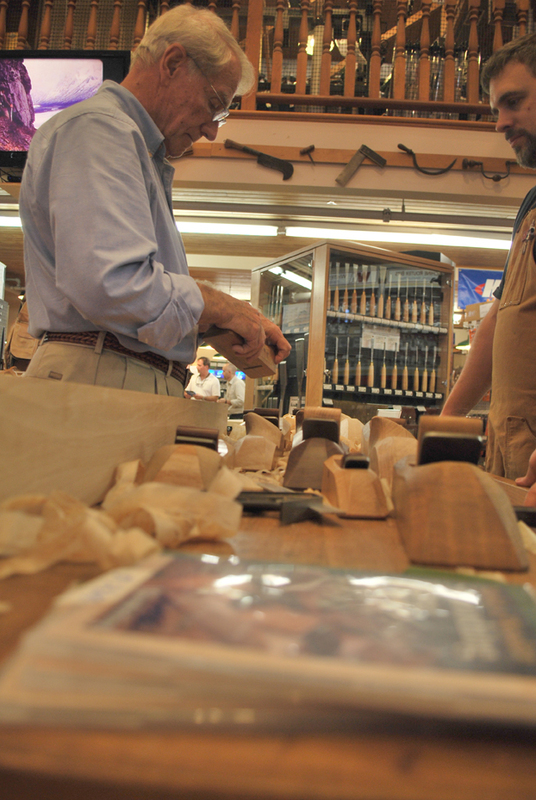 Frank is a wonderful fellow filled with fantastic stories about woodworking and about his life. 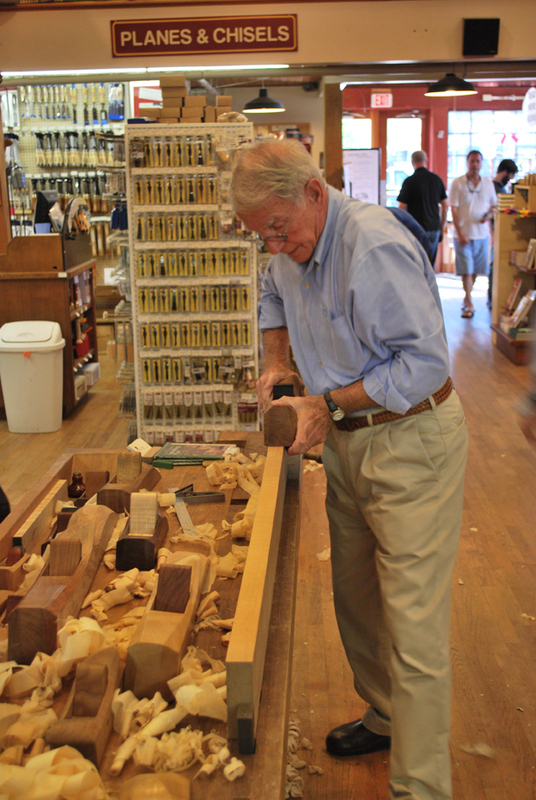 I also got to watch as Frank tried out some of Scott Meek’s wooden hand planes. Frank set and worked the planes with the hands of a true master of our craft and I could tell that Scott was a bit nervous to have such a woodworking luminary using his tools, maybe wondering what Frank would have to say about the planes. After making a few passes with some of the planes, Frank had nothing but glowing reviews of Scott’s work. He complimented Scott on his fine hand tools and even remarked that he had made a few wooden planes in the past, though none of them were ever as fine and well-made as the ones Scott had on display. I would call this a ringing endorsement, especially for Scott’s class at Highland, on November 8th and 9th, where he will be teaching folks how to make these wooden planes. I closed out my night on Friday wishing Scott the best and letting everyone know I would see them in the morning. When Saturday rolled around I was not quite as early as I wanted to be for the event but still got to spend a few hours hanging around the store and talking with folks. 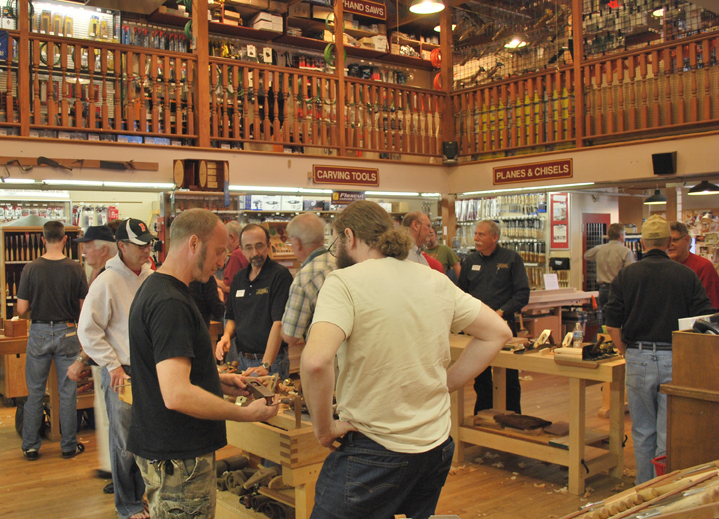 The event was great, Highland had a steady crowd of folks interested in the tools on offer. Frank almost always had a crowd around his bench as he demonstrated his dovetailing techniques and offered his woodworking wisdom. 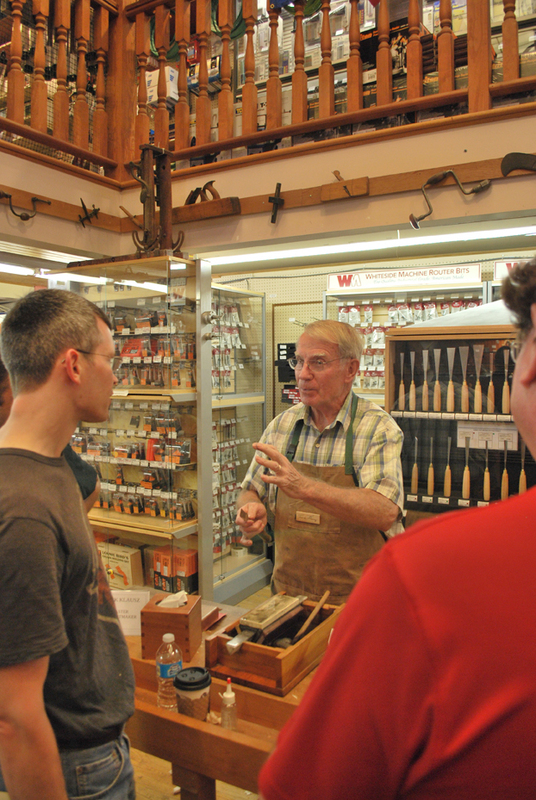 Chris Kuehn was there from Sterling Toolworks, showing off some of his fine tools and inviting people to try their hand with some of his pieces. Scott was making some pretty mean shavings with his hand planes and probably reduced a pine 2×4 down to next to nothing by the end of the day. The crowd around the various Lie-Nielsen benches was thick and the planes saw a lot of use. I think everyone that got the opportunity to try out one of their fine tools left knowing exactly what you can do with a solid tool. I was personally able to pick up that No. 62 Low-Angle Jack and brought it home to my shop after the event for a test run. It is a beautiful plane and I look forward to working with it on some upcoming projects. 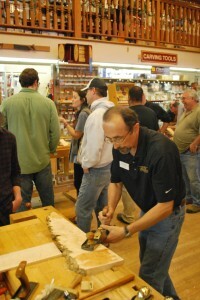 The Highland Woodworking Open House was a lot of fun, and a great way to spend a few hours this past weekend. I learned quite a bit just standing in the room listening to various woodworkers talk. If you get the opportunity to come to the store for one of these events I highly recommend it. 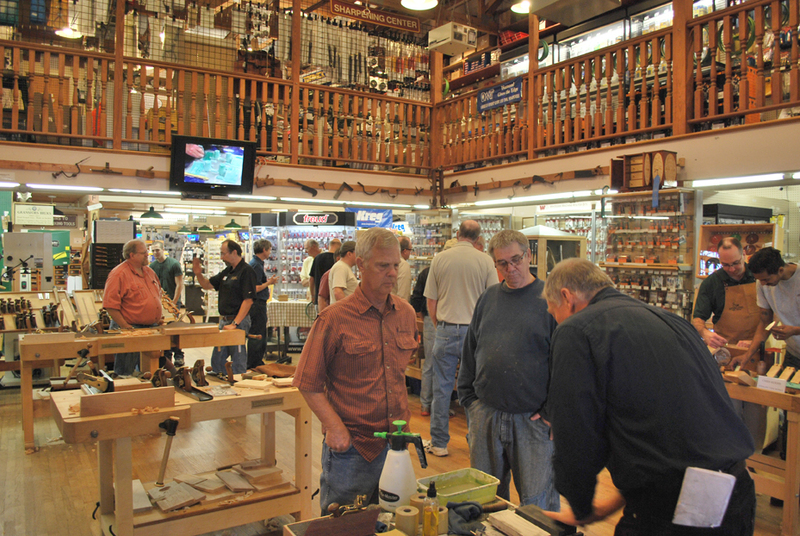 They are filled with people all interested in the craft that we love and the advice can’t be beat.